Badly damaged vehicle from the scene of the deadly San Leandro crash. - May 24, 2014. The suspect in a strong-arm robbery was injured in a fatal crash that killed another person in San Leandro on Friday night, police said. Officers responded to a report of a strong-arm robbery at a RadioShack store at 1359 Washington Ave. around 8:50 p.m., police said. The suspect, identified as a black man in his 40s, bought an electronic item with counterfeit money, according to police. When the store clerk confronted the suspect about the fake currency he threatened the employee and fled with the item, police said. The suspect was seen entering a vehicle and the car's description was sent to police. An officer saw the suspect vehicle as it exited a parking lot onto Davis Street and attempted to stop it, police said. The vehicle sped off and the officer lost sight of the car as it continued north on San Leandro Boulevard, according to police. 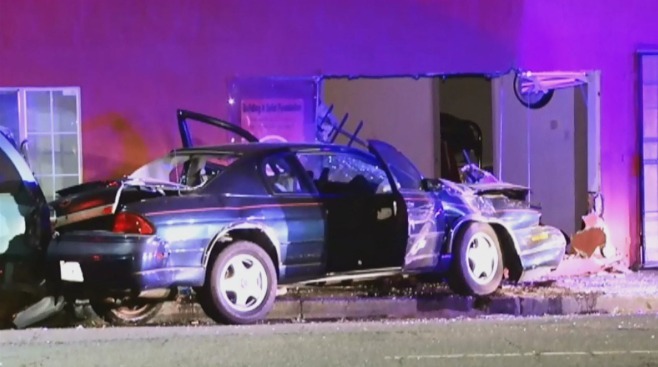 A short time later, officers located the vehicle crashed into a building on San Leandro Boulevard at Apricot Street near the city border to Oakland, police said. 7 Killed in Calif. College Town "Mass Murder"
Officers performed CPR on a female ejected from the car near the crash but she was pronounced dead at the scene, according to police. The suspect was also ejected from the car and transported for his injuries, police said. He is being held on suspicion of robbery and murder, according to police. Police are working to determine if the female was the driver or passenger of the vehicle. Her identity has not been released pending notification of her next of kin. Oakland police is investigating the cause of the collision. Anyone with information on this incident is asked to call San Leandro police at (510) 577-3230 or anonymously at (510) 577-3278.